Durable, corrosion resistant decorative coating for ferrous and non-ferrous metals, certain plastics and wood. The decorative hammered appearance is smooth to the touch and sheds water well. It is available in 14 popular colours. Available in 14 metalic colors. This is a brilliant gloss finish which will retain its sheen for years. As always it is a durable, corrosion resistant decorative coating for ferrous and non-ferrous metals, certain plastics and wood. Durable, corrosion resistant decorative coating for ferrous and non-ferrous metals, certain plastics and wood. The delicate forged appearance is smooth to the touch and sheds water well. It is available in 5 metalic colors. Can be applied by roller or brush. 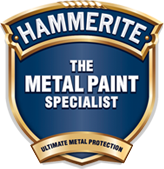 Hammerite Kurust Blister is a water-based rust-converter primer to stabilise rust prior to topcoat application.